This one’s for you, Cathy! 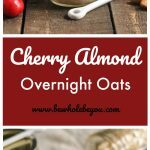 So here you are, my dear, a delicious and simple recipe for Cherry Almond Overnight Oats. It could also be called Cherry Vanilla Almond, but Cherry Almond will do just fine. I have been following Melissa at My Whole Food Life for several years now. She uses ground vanilla beans in a lot of her recipes but they are super hard to find. I came across some on Amazon and have been adding them to some of my recipes recently. Real vanilla bean is absolutely like no other. It is quite sad that vanilla beans are black and yet everything that is vanilla flavored out there seems to be white or an ivory color. A bit deceiving I believe! Then again, if you get real vanilla bean ice cream, the little black specks are visible and they make it all so much more delicious. 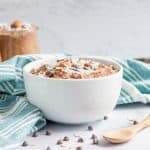 I added some coconut to this recipe as I have been putting it into my oats almost daily, but don’t worry if you aren’t a fan, you can skip them. Cherries aren’t in season right now but I had frozen cherries in the freezer and they worked great. As always, you can make these gluten free and dairy free if you choose. Eat them hot or straight from the fridge on the go in the morning. Anytime breakfast is ready before you even wake up in the morning is a big win for me! Seal and store in the refrigerator for at least 4 hours before serving. Enjoy hot or cold and on the go! Yes! I caught this on your site last night and made it right away. This is now my very favorite, closely followed by Banana Bread Overnight Oats. Thank you so much for putting this together. I forward many of your recipes to my friends who enjoy good food. So glad you’re on the web! Cathy! It was your approval alone that makes this even better. Glad you liked them! Thanks again for all your support! Waking up to breakfast is the best! Waking up to this will make for a great way to start your day! Yay for make ahead breakfasts! These beauties look so yummy, my whole family would happily devour them in the morning! And that makes for a perfect start to the day! Yes, both are just so good! 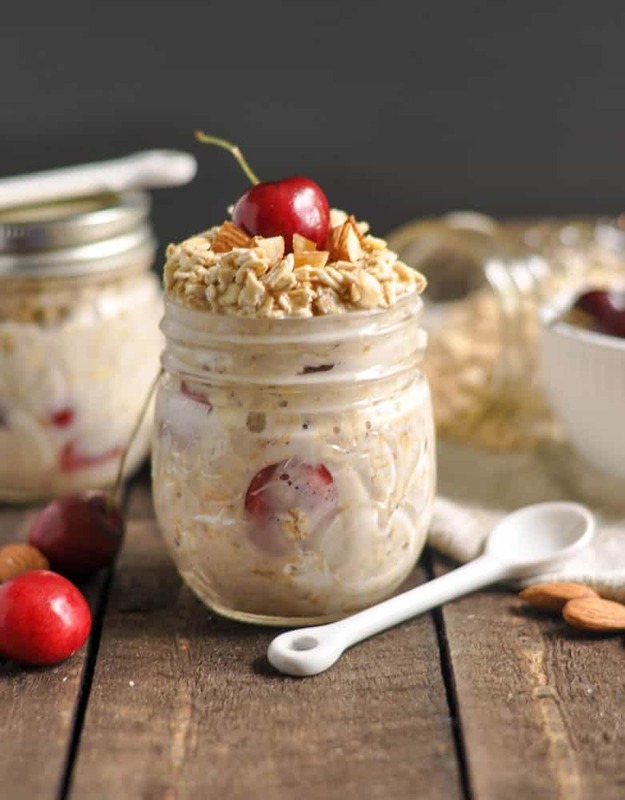 I love overnight oats and these look simply delicious! Perfect for making up north for the 4th too! Yes, Cherry everything right now for me! Oohh, thanks to Cathy for requesting this recipe! 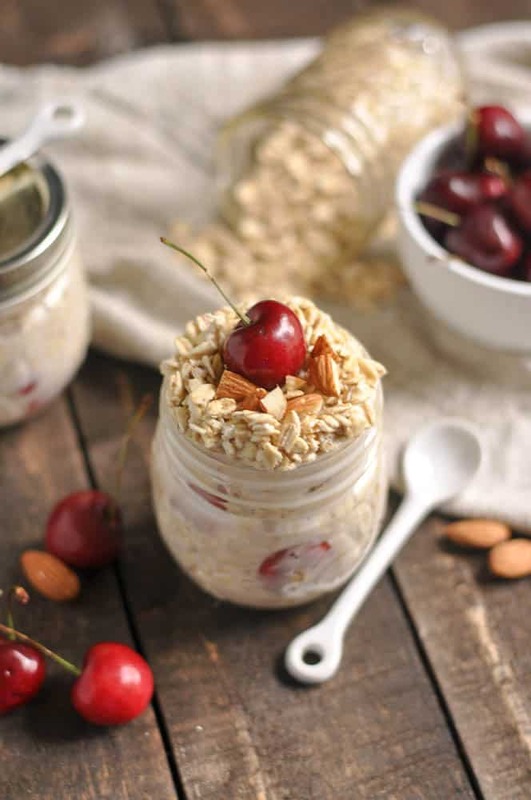 These cherry almond overnight oats are calling my name! Would love to wake up to this for breakfast! Yes, Cathy is fabulous. 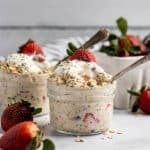 She’s one of my readers who is equally obsessed with Overnight Oats. Enjoy! Hi Lorie!! The cherry and oat combination is so perfect. Can’t wait to try it! Love overnight oats too. I haven’t made overnight oats in awhile, I need to do it again. Especially with cherries to help fight inflammation! Good call on the inflammation! The cherries I’ve been getting have been SO good lately. I’ve never even thought about adding them to my oats but now I must! Yes! It’s my husband’s favorite Oat addition. Cherries and almond are so good together! Love this easy breakfast idea! What pretty little oat jars! Much nicer presentation than my usual lazy bowl. And the flavors in this sound fantastic. How many Calories is this? Thanks for the recipe! Hi! So sorry for the delay in responding. I don’t count calories but if you plugged the recipe into a calculator it should work! Thanks! Have you tried this with fresh cherries? Should they be frozen? 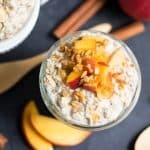 Any overnight oats with almond flour? You could do frozen or fresh! I’ve never used almond flour in my oats but I love it in a lot of other recipes!